Visa vs Mastercard – Does it Matter? What are the arguments for and against Visa vs Mastercard? It really doesn’t matter whether the credit card in a consumer’s wallet is stamped Visa or Mastercard. It doesn’t matter because there’s no real difference between these two credit cards. They are both widely recognised in more than 200 countries and it’s rare for a location to accept one card and reject the other. The only thing that is important to understand is that Visa and Mastercards are merely payment processing networks. While the cards are issued by banks, the payment processing networks act as facilitators between the banks and the merchants who supply the goods or services. So, with this in mind, it’s really more important to consider the pros and cons of what a bank’s credit card offers rather than to worry about whether it’s a Visa or Mastercard. Added perks offered by both Visa and Mastercard include payment protection, rental car insurance and fraud security. However, both credit cards may not offer perks such as rewards programmes, zero percent balance transfer deals or cash backs. Visa vs Mastercard only comes into play if certain perks are important to the consumer. 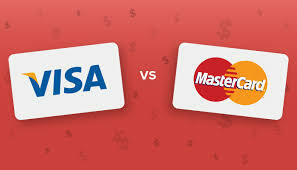 What are the differences between Visa and MasterCard? Both these credit cards offer different tiers of benefits. The higher-tier credit cards include perks such as concierge services, discounted vacation and travel bundles, and access to private airport lounges. However, Mastercard offers one notable perk not matched by Visa. Mastercard holders are given a price reduction perk of between 60 and 120 days if they have purchased an item that is reduced in price within those time-frames. (Please note that there are certain exclusions). Visa credit cards have two levels of benefits. There is a standard or “base” level card or the more upmarket Visa Signature credit card. What does the Visa base card offer? What does Visa Signature offer? There is the standard or “base” card, or the World and World Elite cards. What does the base Mastercard offer? What does the World Mastercard offer? What does the World Elite Mastercard offer?